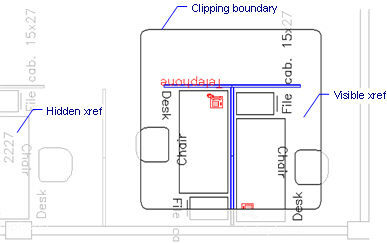 Clips externally-referenced drawings with polygons to hide parts of them, and adjusts the front and rear clipping planes (short for "xref clip"). 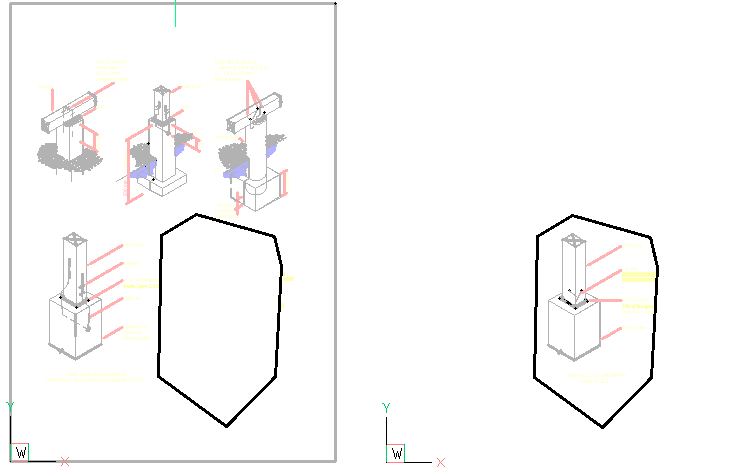 In the figure below, the hidden portion of the xref is shown in light gray for illustrative purposes only; it is normally not seen when clipping is turned on. Turns on clipping boundaries that were turned off by the OFF option. Turns off clipping so that all of the xref is again visible. The clipping is saved, and is turned on again with the ON option. This option does not operate until you create at least one clipping boundary. It is no useful for 2D xrefs. Specify front or back clip point - specifies the position of the front or back clipping plane: pick a point, or enter coordinates. The cutting plane is parallel to the current viewpoint. Remove - remove the front or rear clipping point. Inverts the clipping mode so that the interior of the clipping boundary is hidden from view (the the outer area is visible); repeat this option to invert again, making the inner portion visible. It is much easier to toggle the Invert status through the Properties panel. Erases all clipping boundaries; does not prompt or warn you. Generate the polyline with this option, and then exit the XClip command. Use the PEdit command to edit the polyline. Restart the XClip command, and then use the New | Select polyline option to turn the polyline back into a clipping boundary. Delete old boundary(s)? [Yes/No] - type Y or N. Caution! This option replaces all existing clipping boundaries with the new one. The command continues only when all previous boundaries are deleted: typing No at this prompt cancels the XClip command. Select polyline - choose any open or closed entity made from polylines, such as splined polylines, rectangles, donuts, and polygons. While the polyline does not need to be closed, it cannot cross over itself. pdfclip - clips a PDF underlay. XRef - attaches and controls externally referenced drawings through the Drawing Explorer. -XRef- attaches and controls externally referenced drawings through the command bar.